It's only Monday and I just have to share with you my favorite find of the week. Now lately, like my friend, Tracey, I haven't been feeling the love with the prices I've been seeing at my favorite thrift stores lately. In fact, lately, I've been pretty disgusted with the high prices I've been seeing on thrift store items. For example, last week at one of my regular thrift stores, they had an adorable vanity, white chippy paint, perfect. Price, $150.00! Today, however, the thrifting gods were smiling down on me and I couldn't have been happier when I found these. 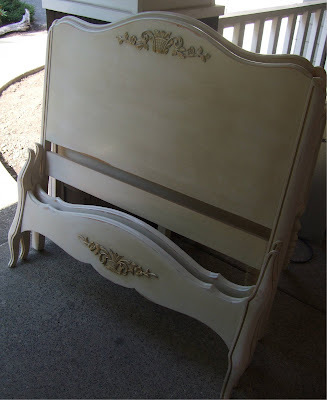 Not one, but two amazing vintage French style twin bed frames. I'm not sure, but I think they are from the 60's. All they needed was a little cleaning and some light sanding and they are good to go. Feel free to click on the pictures for a close up. The best part is I got them for a great price. Here's a close up of the applique on the headboard. These sweeties will be heading over to my Stars & Splendid booth this week. So, what have you found recently that you're excited about? A GREAT FIND indeed! Wowzers! I just LOVE LOVE LOVE it when something works out in my favor, don't you? My oh my, did you score with those bed frame beauties. Congrats! And best of all they are nearly good to go. So many times, the bargains need a fair amount of elbow grease. I have been on a thrifting moratorium, so it helps to live vicariously seeing what gems others are finding! Nice job on the beds, Lisa! Totally agree with you regarding prices--odd too, since we're in a recession and so many people have lost their jobs. I hear Portland GoodWill opend up a "decorator" boutique in the high-rent district downtown. Say it's not so!! The thrifts around me have gotten outrageous and they never have anything anymore. I think things are being sold before making it into the stores. Those beds are 2die4! Anytime you can score a pair, you better grab 'em. Good for you...makes me want to get out and look harder for something just as pretty! Just found your great blog today, after getting home from - you guessed it - thrift store shopping. I have to agree with your comment about their prices. I looked at an older lace tablecloth, and they wanted $30 for it! BUT...I have found a thrift store that is priced like a thrift store, and have purchased many goodies there, which I will be showing periodically. Great buy on those beds, at any price! They're beautiful! Score!!! Love the beds, and two of them to boot! Super great find of the week, Lisa! Love the detail on the beds. Great finds!!! I agree about the thrift store prices too, it is that way all over. What a wonderful find, those beds! Reminds me of my bed growing up. We all shoot ourselves now, as we sold them in a yard sale when my Dad moved years ago. I would love them in my home!! Great blog. Thank you to Sweet Natasha!